Is stubborn chin fat ruining your otherwise perfect profile? At Dermatologic Surgery Center in Northeast, OH. we offer a treatment to solve that: Kybella. Kybella is a new non-surgical procedure that reduces the appearance of chin fat. 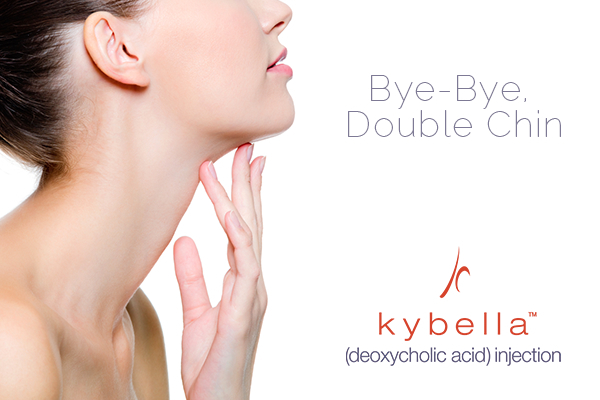 A synthetic version of Deoxycholic Acid, Kybella destroys and removes the fat cells underneath the chin. This will enhance your symmetry and give you a more youthful appearance. Kybella is an FDA-approved injectable that destroys fat cells underneath the chin. This improves the appearance of the patient’s profile, giving them a slim, youthful appearance. Kybella is administered via a series of injections in the submental region-i.e. : underneath the chin. Once inside the body, the injectable attaches to nearby fat cells, destroys them and the body then disposes them. The number of sessions needed and series of injectables are determined by your doctor. It is important to explain your desired result, so a personalized plan is accurately tailored to you. Kybella is a synthetic of deoxycholic acid. This acid is a naturally occurring substance within the body that assists in the disposal and absorption of dietary fat. This property is what helps Kybella work effectively. Once injected into the chin, it destroys the cells and renders them unable to retain fat. Kybella is available for use for patients over the age of 21. Why should you try Kybella? If you are tired of dealing with stubborn under chin fat, this is the treatment for you! Patients who have used Kybella have seen significant results with this treatment. Patients who undergo this procedure notice a difference in their profile. Where there used to be fat, clients now see a more symmetrical shape. At DSC, we like to use Kybella because of its effectiveness. Kybella is a one-of-a kind procedure that reduces under chin fat. It’s the best alternative for our clients who don’t want a surgical procedure. If you would like to learn more about Kybella, schedule a consultation with us. Our staff will take craft a personalized plan for you. DSC strives to provide the best in aesthetics treatment for our clients. So, don’t hesitate to come in! We are in Medina, OH. Let us help you begin your aesthetics journey today!